Our first post was in September 2010. We didn't know much about the subject matter. But, after doing a few searches of the web, at the time, it seemed clear that Thomas and Margaret (Fryer) Gardner needed more attention. Every year, we have done a summary of posts for the year, using an image that showed the most read of the posts. Unfortunately, we forgot to do one at the end of 2017. We did one for the other blog: Henry Lunt of Newbury. So, with the idea of its better sooner than later (many times), we present this graphic with some commentary. Many times, the top entry is the same for the 30-day and the All-time views. 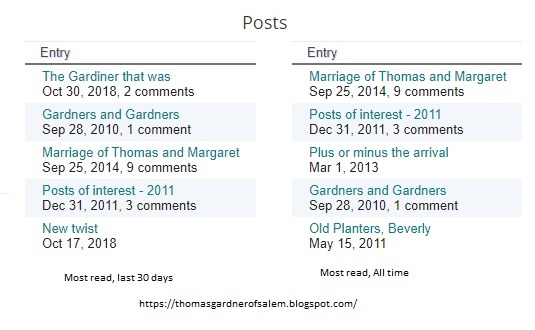 However, today's counts have the top of the All time (Marriage of Thomas and Margaret) pushed to third in the short term. 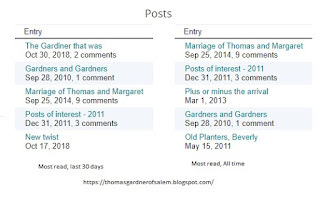 BTW, for an update, see this post (Margaret anew) in which we address the issue of Margaret as the mother of the Gardner children. The new post (The Gardiner that was) at the top deals with a bit of research that covers several topics and has been an interesting introduction to things not considered before. Its theme goes with the 'All things Gardner' focus that has New England as the center from which the American experience expanded. If one allows that Virginia, and it surrounds, was New England, then that does cover the majority of the case. As we have also touched, and will continue to do so, on the Native experience, that of the southeast and the west, principally the Spanish territory. We got acquainted with the sea-based life of the time. As usual, more general things come to fore, such as there being a social media even then. It was wind-driven and ought to give us an endless amount of research topics. Two posts of long-standing interest are still there. Gardners and Gardners was an early effort to identify Gardner families starting with the work of Dr. Frank and continuing with new information as we heard from other Gardners. There have been many queries as to relationship with Thomas, as well as trying to determine information about other Gardner/Gardiner immigrants. This experience is one motive for the "All things Gardner" research effort. The other post (Post of interest - 2011) was our first summary post, as that was our first full year of blogging. It was in 2012, that we did the first recap (Summary - 2012) and continued until 2017. In the last one that we did, we had a link backward (Summary - 2016). We will put in a forward link, to boot. As well, this year, our recap will include a table of posts by month for each year. Now, the final new post (New twist) summarizes the running down of the location of Thomas' remains. Say, why? Due to the time of the year, we see people visiting graves of their ancestors. Too, Salem is planning to upgrade it Charter Street Cemetery. Well, the NEHGS has a book of cemeteries of Massachusetts. Does it mention Gardner Burial Ground? Need to find out. 'findagrave[. ]com' does now. It is titled 'defunct' for now; we'll get it on the map and more. Say, build a 3D model of what the area might have looked like in Thomas' time. We ought to get a list of the names of those interned there; after that, determine the status of each of these. We just barely scratched the surface. 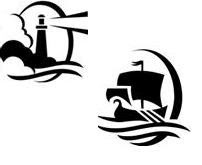 Thanks for reading the blog concerning Thomas Gardner and early New England; too, we are to show how all of this is still pertinent. 12/29/2018 -- Did the summary for the year.